During his interview for “Die Presse”, Rapid president Michael Krammer suggested the new stadium issue is practically resolved. “We’re exactly on schedule now. The hardest thing was preparing the investment”, Krammer said. Along his words delivery of Allianz Stadion will be timely and judging by the construction status it’s indeed much taken care of. Within just a year Rapid’s former stadium was transformed into nearly complete stands with a roof. Interior works are ongoing inside the main building and all of the effort is focused on ending works safely before the mid-year opening. 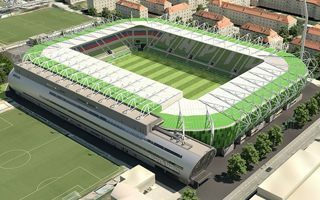 The €53-million project will see Austria’s largest private stadium, which itself is a significant landmark. At the same time Rapid is close to finishing the country’s record crowd-investing campaign, having already raised €2.9 million (previous Austrian record stood at 1 million). Now Rapid’s plans are set much higher. Relocation to the club’s third ever stadium for the 2016/17 season is only a means to a greater goal. That’s not only dominating the domestic scene, but also advancing to the top 50 clubs of Europe.